Combining her longtime expertise as a hypnotherapist and clairvoyant, with fascinating and completely true case details derived from over 80 of her clients, Jill K. Thomas, CHT presents Tales from the Trance: The Sad, the Strange, and the Solvable, an insider�s glimpse into the feelings and issues blocking ordinary people from moving forward in their lives. These real-life stories will variously surprise, entertain, sadden, or/and inspire, but regardless of the reaction, every reader will find something of themselves among its pages. More importantly, hearing about these very human�and sometimes quite common�struggles could open a door for many, because changing peoples� attitudes toward their own problems is usually the difference between their continuing to suffer, or choosing to seek help. 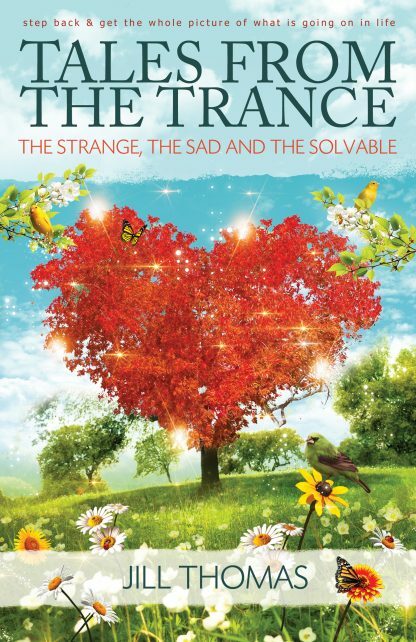 Tales from the Trance is perfectly timed for our disconnected society, where individuals� painful internal conflicts are too often played out on a larger scale in random violence, escape through drugs and other addictions, materialism, and social media warfare. What better time to get back to the basics: our journey of being humans with issues that can be resolved through compassion, intelligence, and patience. Jill K. Thomas, CHT, is a Board-certified hypnotherapist, author, clairvoyant, medium, and channel, who has devoted her life�s work to helping anyone whose issues limit their personal freedom and happiness. She has appeared on numerous radio shows, maintains her popular online blog, �Confessions of a Hypnotherapist,� and has authored articles for magazines read across the nation. In 2012, Jill wrote and published Feed Your Real Hunger: Getting off the Emotional Treadmill that Keeps You Overweight (www.feedyourrealhunger.com), an invaluable guide for individuals trying to lose weight by utilizing self-hypnosis techniques to confront and change core beliefs that bind them to the battle with overeating and negative body image. Jill lives in Encinitas, California with her husband and more cats than she cares to admit!